Marie Yovanovitch admits contentiousness of the issue. 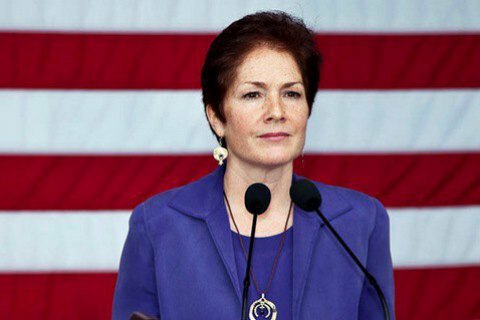 The disengagement of forces and weaponry in the armed conflict in Donbass will contribute to security, which is a prerequisite for the holding of elections in the region, said the US Ambassador to Ukraine, Marie L. Yovanovitch. "Our position is clear: before holding elections you have to have security. How else the elections can be held, if there is no security guarantees? As we see, the agreement on ceasefire, which should have been observed over the past two years, is not complied with. The latest ceasefire arrangements are also violated. It is therefore important that the security was stable," the diplomat said in an interview with Radio Svoboda on 2 November. "To this end, in particular, it is necessary to build confidence. In this context it is worth recalling the agreement regarding the disengagement of forces and weaponry at three sections on the front line. I know that this is a very contentious issue in Ukraine, but if you have the opportunity to pull back forces, it is less likely that they will clash in combat. It is one of the first steps in my view, both for the population and for the whole of the political process - to reinforce security," said Yovanovitch. On 21 September, the participants of the Tripartite Contact Group in Minsk signed an agreement on the disengagement of forces and weaponry in the areas of three settlements on the contact line - Petrovske, Zolote and Stanytsya Luhanska. The disengagement took place only in the first two areas, and was postponed Stanytsya Luhanska in view of ongoing attacks. It was presumed that the disengagement in three areas would pave the way to pullback in other areas of the conflict.